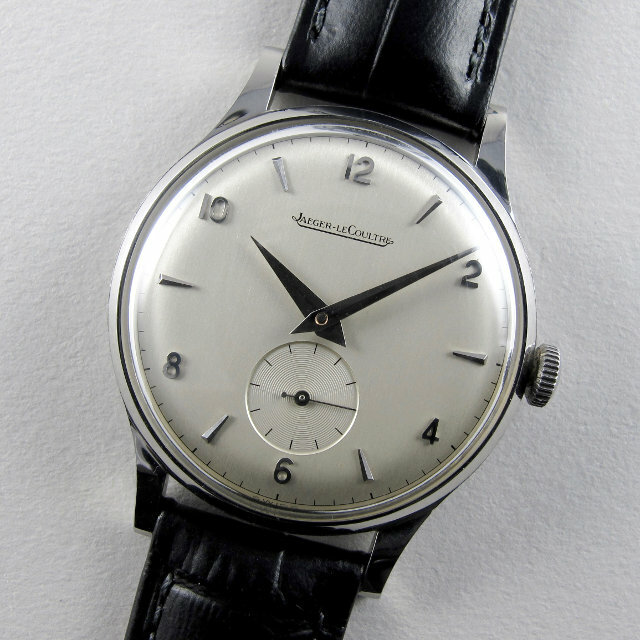 Opening this week’s update is a superb, late 1950s, Jaeger-LeCoulte model which is in lovely condition. The silvered dial has an excellent lustre and is set with applied Arabic and faceted triangular indexes. The stainless steel case retains crisp definition to its angles and edges, with a few light scuffs to the back. Manually wound, the watch is powered by a LeCoultre calibre P480 which is beautifully finished with decoratively damascened bridges. 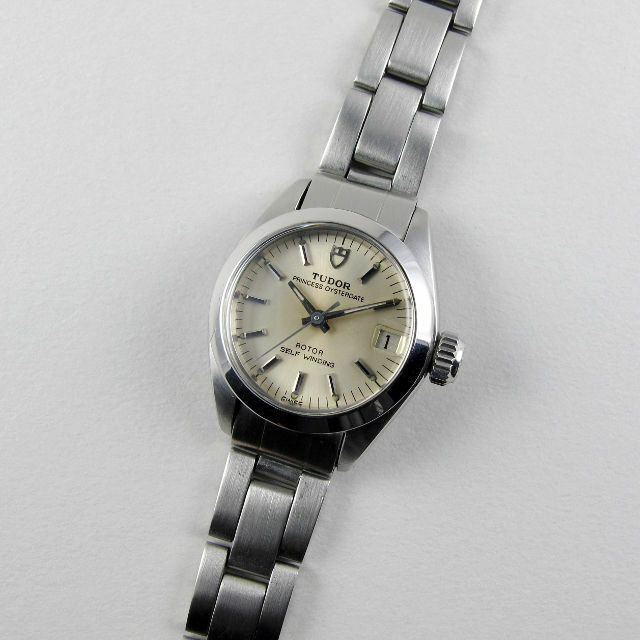 An excellent example of this classic, manually wound Oyster model, this watch has a diameter of 35mm. The silvered dial has applied indexes with broad batons at the quarter hours which have black strips to their edges, whilst the intervening numerals have central black inserts. 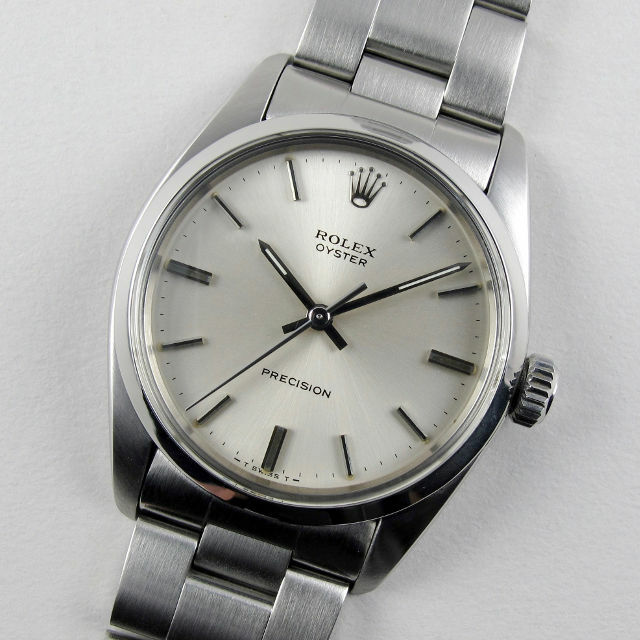 Cased in steel, the watch is fitted with its original, thick gauge, Rolex Oyster bracelet. As part of this watch’s service, it has been pressure tested for water-resistance for depths up to 100 metres. This lady’s Oysterdate model has a silvered, satin finished dial with faceted hour indexes which are centrally set with black panels to increase visibility. The stainless steel Rolex Oyster case has a polished finish and the watch is fitted with its original Rolex Oyster link bracelet. Automatically wound via the Tudor finished ETA 2671, the movement has provision for quick date adjustment via a secondary setting to the crown. 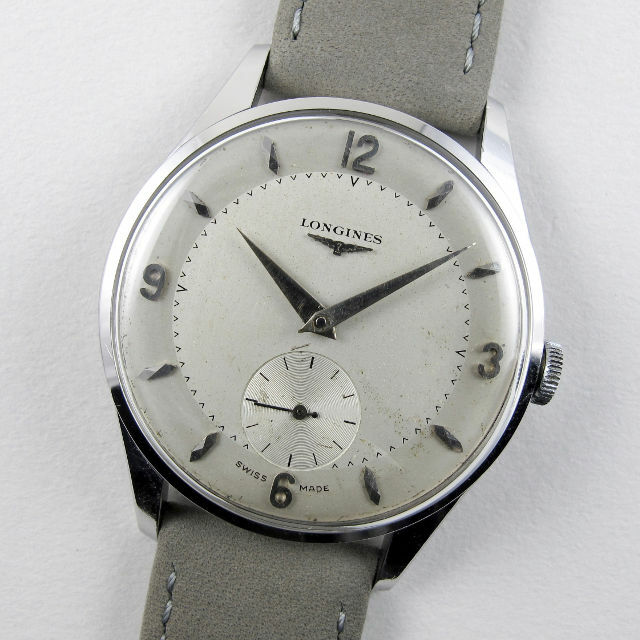 This vintage Longines wristwatch has an extremely characterful dial with a strong two-tone finish and highly unusual, caret-form minute markers. The applied white metal indexes comprise of flat Arabic numerals at the quarters and multi-faceted lozenge indexes at the intervening hours. There is light oxidation to the dial surface, a scratch/depression by the numeral at 5 o’clock and some scuffing at the dial’s edge. 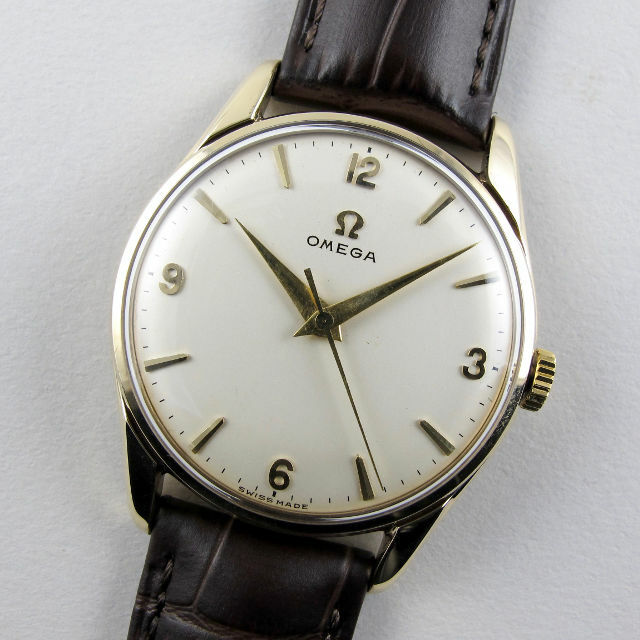 A great looking version of this early 1960s model, this watch has a silk-matt, silvered dial with tapered indexes at the quarters and slim baton markers at the intervening hours. The dial retains a great lustre and there is a very light and warm patina to the surface which enhances the watch’s vintage look. Unusually, the dial of this watch does not have luminescent accents and the hands are correspondingly without luminescent panels. The stainless steel case is relatively large for the period of production with a diameter of 35.5mm. 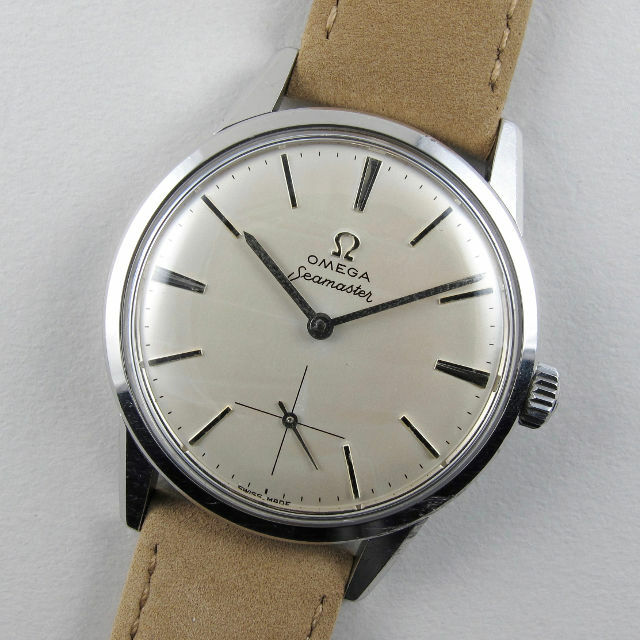 Made in 1960, this Omega wristwatch has a handsomely configured silvered dial which retains a good lustre and is set with applied, gold hour indexes. The 9ct yellow gold case has down-turned lugs with stepped edges. Manually wound the watch is powered by Omega’s calibre 285 with 17 jewels. 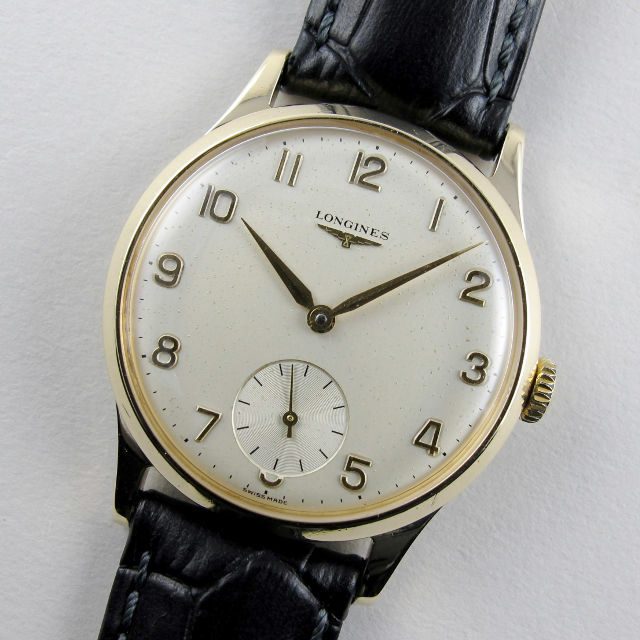 A smart version of this classic Longines model, this 9ct yellow gold wristwatch has a silvered dial that is fully set with raised, gilded, Arabic numerals. The solid 9ct yellow gold case was made for Longines by the Dennison case company and is a Dennison Ref. 13322. Manually wound, the watch is powered by the 17 jewel, Longines calibre 30L. 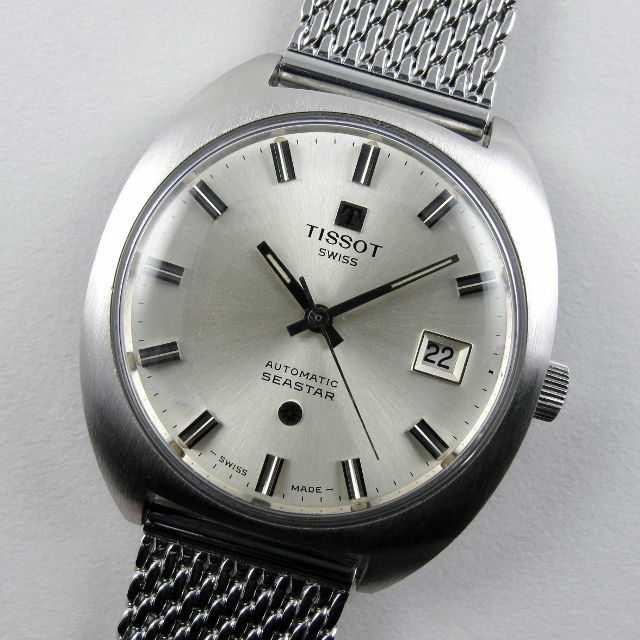 Automatically wound, this boldly designed 1970s wristwatch is powered by Tissot’s calibre 2481 which has provision for quick date advancement. The date will change each day around midnight but can be manually advanced when required by simply pressing the crown towards the body of the case. The Tissot calibre 2481 was developed with Omega and is essentially identical to the Omega calibre 1481. This watch is fitted with one of our new stainless steel Milanese style watch bracelets which is fully adjustable. 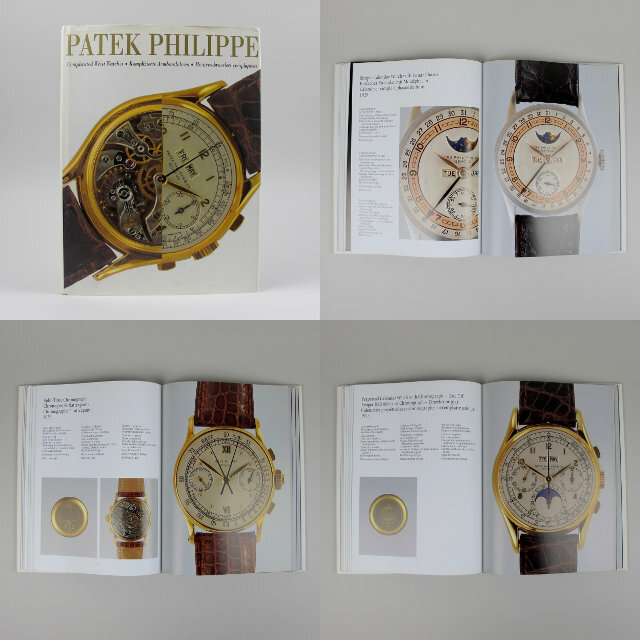 This book is devoted to the complication wristwatches of Patek Philippe and is beautifully presented with excellent colour illustrations throughout. In total, 62 complication Patek Philippe wristwatches are illustrated, with a few further watches illustrated in the introduction. Some of the most famous and important wristwatches made by Patek Philippe are shown, many with additional photographs of their movements and inside case backs. Originally published in 1997, this book has been out of print for many years and this is a good first edition copy, complete with dust jacket. To automatically receive these updates via email, please select the ‘Join our Mailing List’ tab at the bottom of any of our web pages.